Moving from the conclusions of his works on Roman Paestum ('Paestum romana', in Poseidonia-Paestum, Atti del XXVII Convegno di Studi sulla Magna Grecia, Taranto - Paestum, 9-15 ottobre 1987, Napoli 1988, 33-115; Paestum romana, Roma 1999), the author analyzes the possible correspondences between the original Greek cults and the extant urban temples of the Achean colony of Posidonia. While the Northern sanctuary housed the cults of Athena (the 'temple of Ceres') and an hypetral cult of Zeus, the Southern sanctuary originally included the cults of Hera (the 'Basilica'), of Apollo (the 'Temple of Neptune') and of Aphrodite (the destroyed late archaic temple under the Roman Macellum, possibly substituted in the Roman times by the amphiprostyle temple or by the so called Italic temple), with strong similarities with the urban sanctuary near the agora at Metapontum. A final identification is proposed for the cult practiced in a small shrine near the 'temple of Neptune'-Apollonion, which is provided with an unusual basin for ritual immersions, to be compared with the analogous krenai of the Arcadian sanctuary of Lusoi and of the sanctuary of San Biagio alla Venella near Metapontum, both dedicated to the goddess Artemis with the epitheton of Hemera. In the multidisciplinary study into the Cretan hieroglyphic script on seals, which advocates a synergy between anthropology, archaeology, epigraphy and semiotics, a connection can be postulated among the inscription’s meaning, the shape and the material of the seal on which it was engraved, the way the signs are arranged in the graphic space, the syntax of specific sign-groupes, and the sphragistic use of seals. Concerning these very aspects, the so-called hieroglyphic ‘Archanes formula’ reveals a writing habitus completely different from the other hieroglyphic ‘formulas’, thus suggesting a different meaning and scope. This inscription later reappears in Linear A as the much discussed a/ja-sa-sa-ra-me ‘libation formula’. It now seems generally accepted, from a combinatory point of view, that its meaning is linked to the semantic field of ‘to give/to offer to – the deity’. This in turn allow us to hypothesize that hieroglyphic seals bearing the ‘Archanes formula’ may well have been used as personal status symbols and sphragistic instruments by factions or corporate groups who justified their claims to keep surplus resources thus subtracting them from the community as ‘offerings/things delivered to the deity’. This essay discusses the problem of the origin and use of the Athenian nomos argias. The law was probably part of the archaic agrarian legislation and it originally concerned inheritance and family rights. However, over the course of the classical period, it broadened its field of application, becoming a law against unemployment and begging. In the face of the biggest threat for the stability and endurance of any constitution – the political conflict between the rich and the poor, and their respective and incompatible ways of understanding distributive justice –, Aristotle advises politicians and legislators to recover a sense of philia among citizens and to promote the middling class (mesoi), which comes to be seen as a mediator between both groups. The excesses originated from covetousness, so characteristic of extreme democracy and dynasteia, find their origin in the proportions achieved by a specific type of market economy whose only goal is the accumulation of wealth. A city composed of similar but not completely equal oikoi, joined by friendship and ready to exchange their survival goods as well as political services, could take the shape of various mixed constitutions that would eventually earn the majority’s benevolence, and increase the economic level and the paideia of its members. This paper deals with the concept of constitutional change (metabole politeion) in the surviving fragments of Theopompus’ Philippika. In particular, the analysis of the Philippika let to identify three main thematic cores pertaining to this topic: the first group is characterized by those fragments showing a clear relation between the crisis of a form of government and the leaders’ behaviour; the second includes those passages describing the consequences of the adoption of a new constitutional form on the civic community’s customs; the last group is composed by those fragments in which the malpractice and the licentiousness of a community are considered the main reasons for its extinction. Therefore, we can conclude that not only Theopompus undertook a general reflection on the constitutional change, but also his position about this topic reveals itself as very interesting, if compared with the historiographical works of the same period. In Hist. IV 20-21 Polybius praises the role of music in Arcadian paideia and daily life, and attaches great importance to the moral effect of «true music», i.e. music respectful to tradition. However this is only a pose, useful to extol Arcadian moral excellence. This is proved by several evidences in the rest of Polybius’ work: Polybius (XXXVIII 5,4-7) accepts without trouble the tropos metabolikos, typical of ‘new music’ and devoided of educational value; he pays no attention to musical styles and facts, or to musicians; he attaches no importance to the possess of musical education or knowledge, not only by politicians or monarchs from other Hellenic countries, but even by an exemplar Arcadian like Philopoemen; on the contrary, Polybius often disapproves of the exhibition of musical qualities or of interest in akroamata (the most frequent musical term in Polybius’ work), regarding it as proof of baseness. After the Mytilenian revolt against the empire, the Athenians sent to the island a settlement, a cleruchy, according to Thucydides. The duration and, as a consequence, the importance of it depend on the date of a fragmentary inscription (IG I3 66) found on the south slope of the Acropolis, that records the subsequent peace treaty between the Lesbian cities and Athens. The article rejects the traditional high date for this decree, between 427 and 424 b.C., and proposes a lower date, after the Peace of Nicias and before the Sicilian expedition. This article is a case-study: for the first time, geopolitical maps are used as heuristic and hermeneutic tools for a historical analysis of ancient history. Eleven geopolitical cards show the geostrategic function of colonies and roads during the expansion of Rome in Italy between the Second Samnite War and the First Punic War. The maps outline how a dynamic limes-system, together with soft power, is a fundamental element of the Roman grand strategy. This study is therefore a first example of geopolitical Atlas of the Roman Republic. This paper presents an unknown letter by Theodor Mommsen written in 1876 and kept at the National Library ‘Vittorio Emanuele III’ in Naples. The layer and politician Loreto Lena, born and lived in Cassino, is identified as addressee of the letter. This document sheds light on connections between Mommsen and some contemporary savants of Cassino, a city that the famous German scholar visited during his journeys through Campania from 1873 to 1876 while he was working to publish the tenth volume of the Corpus Inscriptionum Latinarum. Mariella De Simone, La lira asiatica di Apollo. Interazioni musicali tra la Grecia antica e il Mediterraneo orientale. 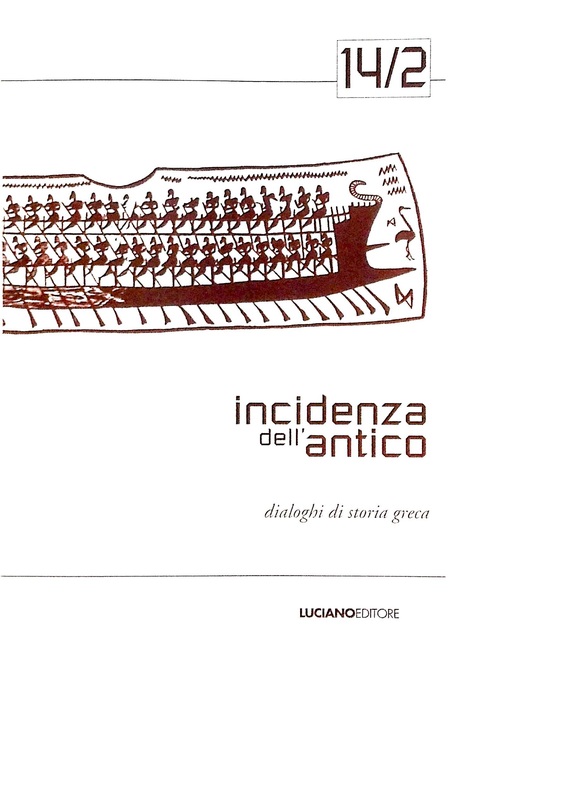 Edizioni ETS (Anthropoi. Studi e materiali di Antropologia storica del mondo antico, 11), Pisa 2016, pp. 235. ISBN 978-8846744555. Paola Schirripa, Il tempio, il rituale, il giuramento. Spazi del sacro in Tucidide. Carocci, Roma 2015, pp. 272. ISBN: 9788843077465. Alex Gottesman, Politics and the Street in Democratic Athens. Cambridge University Press, Cambridge 2014, pp. 248. ISBN 978-1-107-04168-4. Giulia Tozzi, Assemblee politiche e spazio teatrale ad Atene. CLEUP, Padova 2016, pp. 347. ISBN 978-88-6787-504-7. Claudia Brunello, Storia e paideia nel Panatenaico di Isocrate. Sapienza Università Editrice (Studi e Ricerche, 31. Studi umanistici. Serie Antichistica), Roma 2015, pp. V-273. ISBN 978-88-98533-55-8. Archeologia italiana e tedesca in Italia durante la costituzione dello Stato Unitario (Atti delle giornate internazionali di studio. Roma 20- 21 settembre - Napoli 23 novembre 2011), a cura di C. Capaldi, Th. Fröhlich, C. Gasparri (Quaderni del Centro Studi Magna Grecia, 20. Studi di antichità, 2). Naus Editoria, Pozzuoli 2014, pp. 404. ISBN 978- 88-7478-033-4.